The one thing silver investors want to know, is when will the manipulation of the silver price finally end. And who can blame then. It becomes extremely frustrating to watch the silver price fade lower and lower, especially as the Dow Jones Index gets ready to surpass the 20,000 level. So, it looks as if the Dow Jones Index is most certainly well beyond BUBBLE TERRITORY. 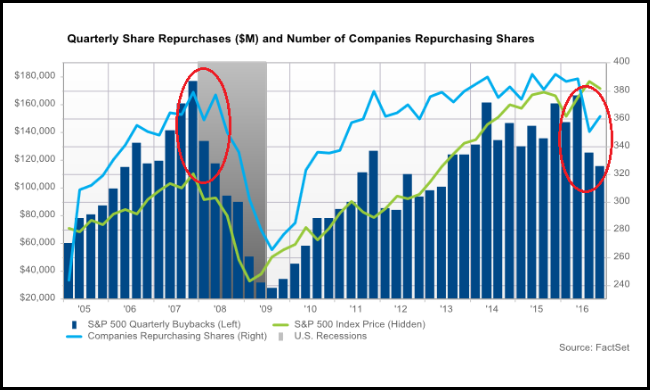 Of course, this won’t stop those with “Sugar Plums Dancing In The Heads & Dollar Signs In The Eyeballs” from jumping onto the runaway stock market train-wreck. This is a horrible failure of the human psyche. Instead of an individual becoming more cautious, prudent and steadfast when markets are behaving completely insane, we find quite the opposite as greed and avarice increase the severity of the BRAIN DAMAGED investor. That being said, the best we can do when the fan finally hits the cow excrement, is not to tell our friends, associates and loved ones who didn’t listen, “I TOLD YOU SO.” Best to keep our big mouth shut. However, I don’t see a problem with wearing a T-Shirt that has “THANK GOD PRECIOUS METALS SAVED MY AZZ” printed on it. Nothing wrong with being respectful, but also subtle. Alright, let’s get to some of the Forensic Evidence on why silver price manipulation will end. Even though Deutsche Bank finally came out and provided evidence that they have been manipulating the silver market, this didn’t do much to change the falling price trend. Ironically, after Zerohedge published the Deutsche Bank Silver Manipulation article on December 8th, the price of silver fell another 8%. I would imagine this must have done wonders for already disenchanted silver investor. Which is why I decided to write this article. Even though the present downturn in the paper silver price can be quite frustrating to many investors, SILVER’S REAL VALUE is totally misunderstood by the market. To understand how the silver price is being manipulated, we have to first understand the silver pricing mechanism. To explain this, I decided to use one of the largest primary silver mining companies in the industry, Pan American Silver. This chart may seem a bit complicated, but it’s not. 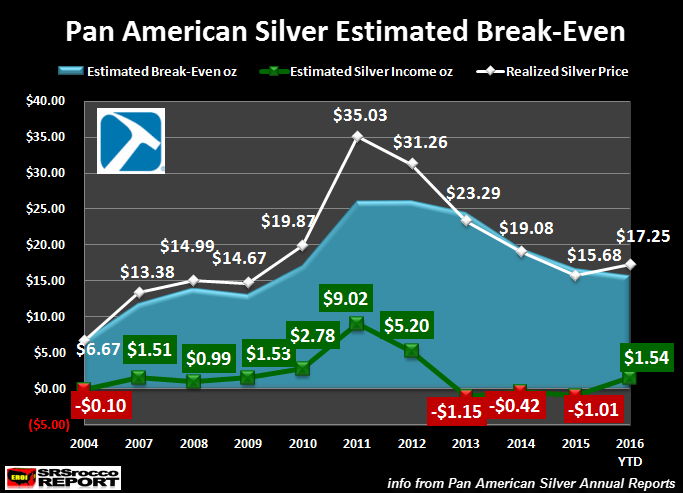 The top of the BLUE AREA is Pan American Silver’s estimated break-even, the WHITE LINE represents the realized annual silver price and the GREEN or RED figures show the estimated profit or loss per ounce each year. Basically, when the white line is above the blue area, Pan American Silver made a profit and when it fell below, they suffered a loss. So, except for a few really good years (2011 & 2012), Pan American Silver did not make much money for each ounce of silver they produced. Pan American Silver enjoyed a $9.02 profit per ounce in 2011 and $5.20 in 2012. However, they lost money in 2004, 2013, 2014 and 2015. NOTE: I did not include data for 2005 or 2006. I designed this chart originally for 2007 and later, but wanted to see what the change would be going back until 2004. 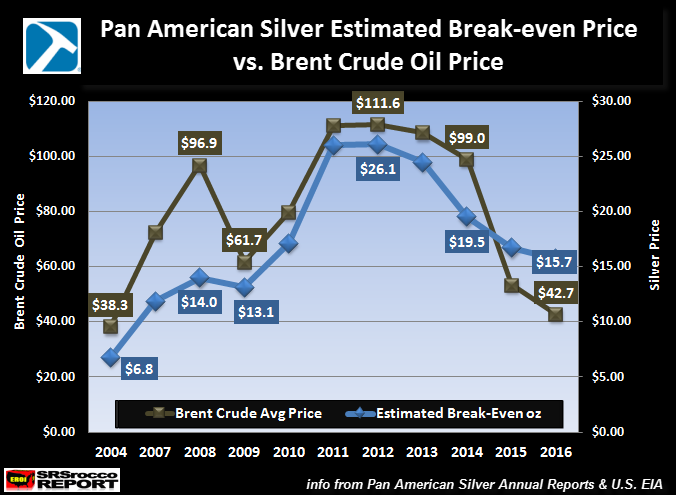 In 2004, Pan American Silver’s estimated break-even was $6.77 versus $15.71 today. Thus, Pan American Silver lost 10 cents an ounce in 2004 compared to a profit of $1.54 in the first three-quarters of 2016. 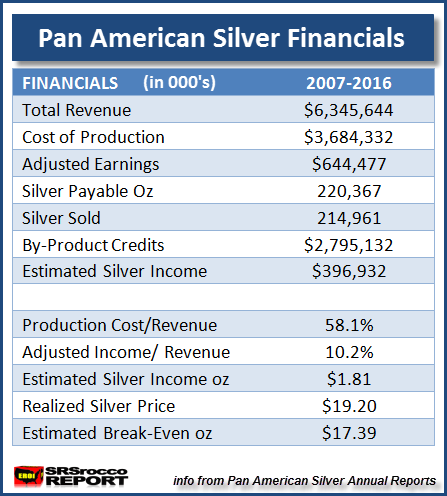 Even though Pan American Silver’s total revenue jumped from $98 million in 2004 to $584 million in 2016 year to date (YTD), it’s estimated silver income was only $27 million for the first three quarters of the year. That’s not much money considering that they increased silver production from 11 million oz (Moz) in 2004 to 19 Moz in 2016 YTD. 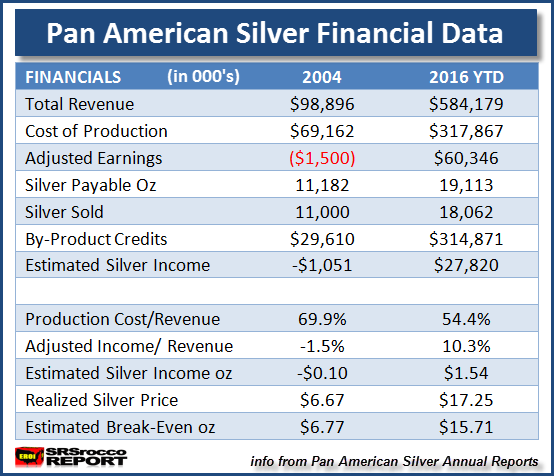 From 2007 to 2016 YTD, Pan American Silver’s total revenues were $6.3 billion, based on 220.3 Moz of silver production. However, 44% of Pan American Silver’s total revenue ($2.7 billion) was from by-product metal production of gold, zinc, lead and copper. When mining companies calculate their “Cash Cost” or their “All-In Sustaining Cost”, they deduct their by-product credits. 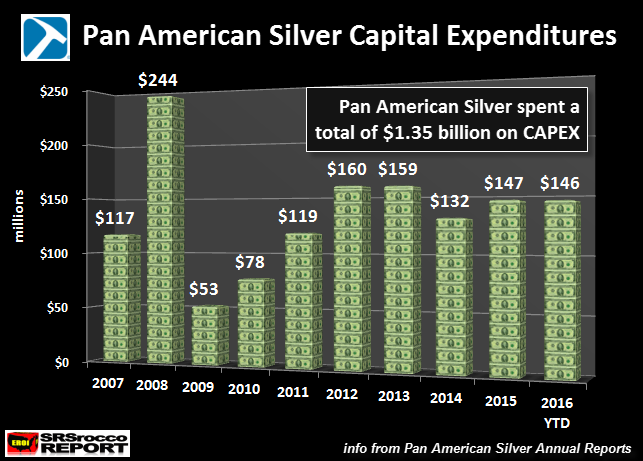 As we can see, Pan American Silver reported $2.7 billion in by-product credits for this ten-year period. Basically, they are artificially lowering their real cost to produce silver by deducting these by-product credits. For example, Pan American Silver’s total Adjusted Earnings from 2007-2016 YTD were $664 million. So, if they just gave away their $2.7 billion in gold, lead, zinc and copper metal production, Pan American Silver would have lost $2.1 billion for that ten-year period ($644 million minus $2.7 billion). Which means, Pan American Silver’s by-product credits weren’t really credits when the company needed them to stay profitable. A CREDIT is only a CREDIT when you don’t need the damn thing to be profitable. That is why I show an estimated “Silver Income” of $396.9 million or $1.81 average silver profit per ounce for the entire 2007-2016 YTD period. Which means, part of Pan American Silver’s $664 million in Adjusted Earnings came from their gold, zinc, lead and copper sales. Regardless, if we realize that Pan American Silver only made a 10% margin of profit ($664 Adjusted Earnings on $6.3 billion Total Revenues) during that ten-year period, that isn’t much money considering the 220 Moz of total silver production. You see, the financial statements reports don’t include how much money they are paying out to maintain, upgrade or add new projects. This is listed in their “Cash Flow Statement.” To get a real idea of their true profitability, we have to look at Pan American Silver’s Free Cash Flow. The net value of Pan American Silver’s free cash flow from 2007 to 2016 was $218.3 million. So, even though they stated they made $644 million in Adjusted Earnings during this period, their true profit was $218 million. 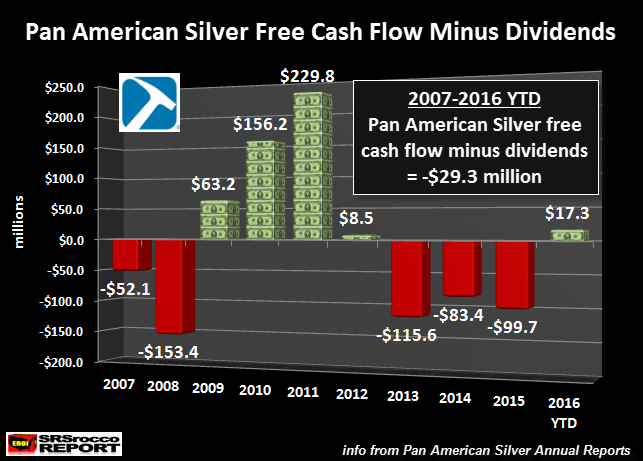 By deducting dividends from Pan American Silver’s free cash flow, we find they suffered a net loss of $29.3 billion for the ten-year period. Of course, this does not include their investments or other items, but it gives us a good ball-park figure of their operating profitability. 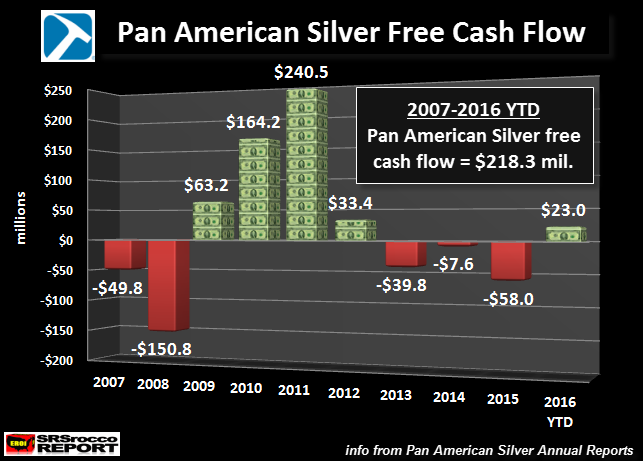 Even if we dismiss all their dividend payouts, Pan American Silver’s free cash flow was only $218 million. Which means, Pan American Silver’s free cash flow of $218 million was only 3.4% of their $6.3 billion in total revenues for the ten-year period. This is peanuts. However, this proves that one of the largest primary silver mining companies in the world made very little in the way of profits producing silver since 2009… and this was during the really good years including the huge price spike to $49 in 2011. Here we can see that Pan American Silver’s estimated break-even trend line (BLUE LINE) paralleled the Brent Crude Oil price. However, the cost to produce silver will continue to increase even though the oil price may be lower. This is due to the falling ore grades and the increased cost to extract, transport and process larger amounts of ore to produce the same amount of silver. For example, Pan American Silver primary silver mines average yield fell from 6.2 oz per ton in 2004, to 4.4 oz per ton in 2015. Now that I have given you the evidence showing that the price of silver is based more on its cost of production than supply and demand forces, why will the silver price manipulation end? There are two ways to value silver. One is based on its “commodity priced mechanism” and the other is due to its “high quality store of value.” I already explained how silver is valued using Pan American Silver as an example. If I added many of the other primary silver mining companies, we would see a range of estimated break-even prices in the $15-$17 range for 2016 (some maybe even lower such as Tahoe Resources, but they are an exception). So, the Fed and Central Banks, using their member banks for trading purposes, make sure the price of silver does not fall too low below its cost of production. This is why it is impossible for these member banks to push the price “WHERE EVER” they like, claimed by some in the precious metals community. There is some method to the silver market rigging madness. If the price of silver was pushed too far below its cost of production, traders would come in by the droves. Thus, taking advantage of a low market price situation that wouldn’t last. 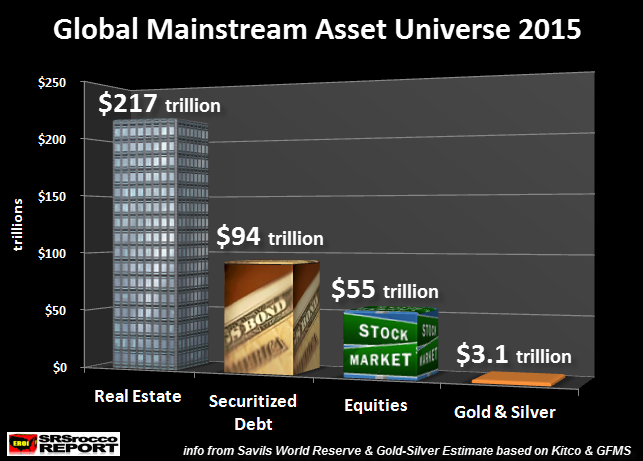 In just the last five years 2011-2015, investors purchased 1.14 billion oz of silver versus 223 million oz of gold. 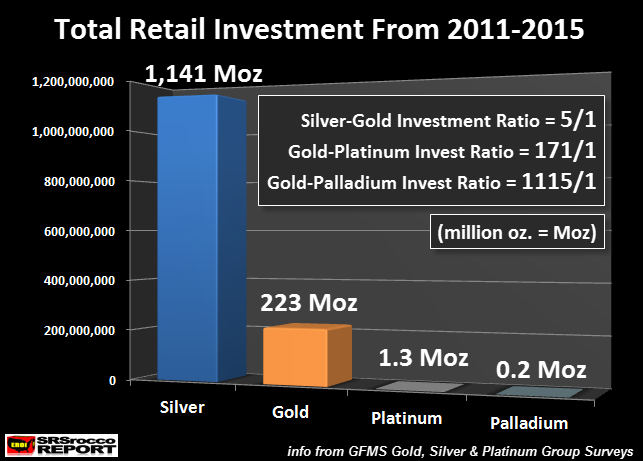 As we can see, Platinum and Palladium physical investments are nothing more than rounding errors compared to gold and silver. The Fed and Central Banks have thrown in tens of trillions of Dollars worth of liquidity since 2008 to prop up these assets. Even though we had a short collapse of these asset values during the 2008-2009 downturn, they are back up in record territory. Unfortunately, the highly inflated value of Stocks, Bonds and Real Estate are based on the burning of oil, now and in the future. Those who own physical gold and silver, do not have this problem. Why? Because gold and silver coins already have the stored energy value locked in them, whereas Stocks, Bonds and Real Estate are ENERGY IOU’s. BIG DIFFERENCE, most in the markets fail to understand. To understand why U.S. and world oil production is in BIG TROUBLE, please read my article, THE COMING BREAKDOWN OF U.S. & GLOBAL MARKETS EXPLAINED… What Most Analysts Miss. While the Fed and Central Banks can control the price of silver (or gold) based on their cost of production, they will not be able to do so when the Greatest Financial & Economic Ponzi Scheme finally implodes. Thus, the value of gold and silver will rise to very high levels as they are finally valued as STORES OF WEALTH, rather than MERE COMMODITIES. And it will actually be much more explosive due to the fact there is very little in the way of physical gold and silver in the world. Unfortunately, most investors continue to pile into the TURBO-DRIVEN HIGHLY-INFLATED STOCK MARKET. The resulting crash and collapse will be far worse than 2008-2009.